Powers/Abilities: Able to become solid or intangible at will. Her limitations are that she must have a source of light for her powers to function. In darkness, she loses consciousness (conversely, a strong enough light source energises her to the extent that she can run up a building at super-speed, and even reverse a fall from a great height). She must also stay within 50 miles of Veronica’s “Shadow Ray Transmitter”, or her powers will fade. 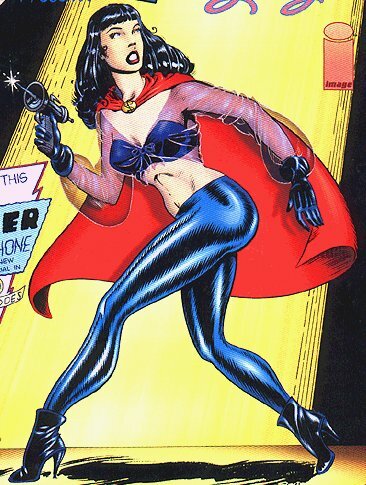 As a reflection of Veronica, Shadow Lady also has a duplicate of the “Shadow Ray Transmitter”. This can be used to produce a powerful beam of light to dazzle her enemies. It also has at least one other function. When Shadow Lady materialises, she is wearing the same clothes that Veronica does: these are replaced by the costume, which is “literally painted on” by the device. (The scene in which Veronica simply changes into the Shadow Lady costume is perhaps explained by the fact that it was a dream sequence). When no longer needed, The Shadow Lady is simply erased by a beam from Veronica’s transmitter. History: New York City, 1947. Beautiful young Veronica Prescott is getting ready for a date. An explosion outside her apartment alerts her to the jewelry store across the street being robbed. Quickly changing into the costume of her alter-ego, The Shadow Lady, she pursues the getaway car in her high powered roadster. Dazzling the crooks with her car headlights and her hand held weapon, she leaps aboard the vehicle, easily overpowers the occupants and takes the wheel, only to gasp in horror as she sees a removal van hurtling towards her. “Murder by Microphone” begins where the first story leaves off, with the car going off the road and crashing into a ravine. The smell of gasoline means that Shadow Lady has only moments to get herself and the crooks out of the car, but it’s too late: there is another explosion . . .
. . . And Veronica wakes up in her own bed. She had “retired” Shadow Lady at the end of WW II, but now she is haunting her dreams. (She had fallen asleep with the radio on and wakes up in time to hear a murder during a live radio broadcast. Shadow Lady comes out of retirement to investigate). Sometime before America’s involvement in WW II, Veronica and her father went to an uncharted island in the Pacific, in search of a meteor. This meteor contained a crystal, dubbed the “Lumen Diffuser”, with unique properties, which Shadow Lady used to battle Nazi spies and save hundreds of lives. Veronica works as a lab assistant to her father, Dr Aloysious Prescott. His other assistant, the hormonally charged Hank Quillup is Veronica’s would be suitor, while red haired model Maize Day is her best friend. None of them are aware of Veronica’s connection to Shadow Lady. At first we are led to believe that Veronica is the Shadow Lady (she wears no mask or other disguise) but it turns out that Shadow Lady is a duplicate of Veronica, a mirror reflection brought to life by the mysterious “Lumen Diffuser” housed in Veronica’s “Shadow Ray Transmitter”. Shadow Lady looks just like Veronica of course. She also has all of her memories, skill, courage and intelligence as well as the powers inherent in being what is effectively a sentient “hard-light” hologram, chiefly that she can become solid or intangible at will.